Derail Holcomb majored in public administration at Barry University in Miami, Fla. Intending to go to law school and earn a J.D. “prior to my tremendous call,” he took a clerking job in a law firm. “I loved doing the research there, but I missed working directly with people,” he recalls. 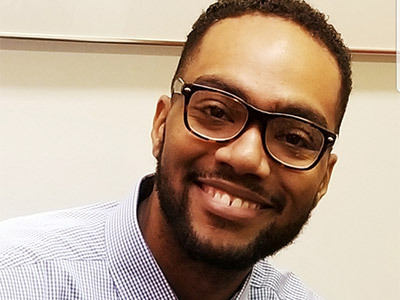 With a Pentecostal and Baptist church background, he “wanted to focus on people in a way that helped them, that pushed them along to be successful on their own.” So he Googled MSW programs—and found Pittsburgh Seminary’s joint M.Div./MSW program with the University of Pittsburgh. Wanting not only to connect with people outside the church but also minister to people within it, Derail moved north to Pittsburgh to enroll. But as a seminary student continuing to discern God’s call on his life, Derail began sensing he should focus on church ministry rather than social work. His rearing largely in urban ministry moved him also to enroll in PTS’s Graduate Certificate in Urban Ministry program in addition to the M.Div. degree. “I want to bring innovation and creativity into what the urban church is in the modern context,” he notes. “I discovered through my PTS experience that there are areas and elements of ministry which will allow me to speak to the social structure of society, and the GCUM program became my avenue of preparation for doing so,” explains Derail. He joined the PC(USA) for its emphasis on education and addressing difficult theological questions. “As a Presbyterian, I engage in trying to answer those hard questions in addition to praying about them. I also feel supported in focusing on needs and being present with the church and the community,” he says. In Pittsburgh, he’s done the latter by teaching Biblical Literacy and Black Church History to eighth and eleven graders at The Neighborhood Academy, which prepares middle school and high school students for college. In the meantime, as he continues this year to discern his next steps after PTS, Derail—who “feels amazing now!”—is planning to move closer to his family after graduation. And return to the warm Florida weather and sunshine!